To receive further updates on this Phillips 66 (NYSE:PSX) trade as well as an alert when it’s time to take profits, sign up for a risk-free trial of Maximum Options today. 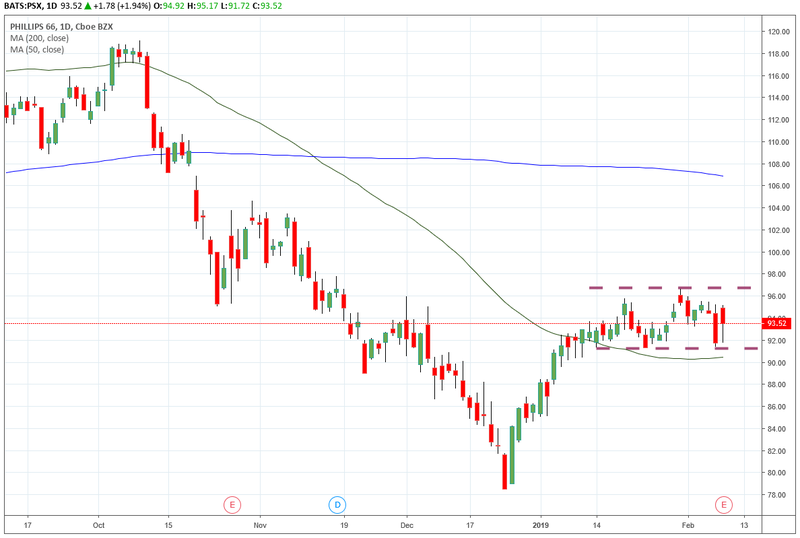 This morning I am recommending a bullish trade on Phillips 66 (NYSE:PSX), the energy manufacturing and logistics company. PSX gathers, processes and transports natural gas, but it also refines crude oil. So, while natural gas is trading below both its moving averages, PSX has exposure to other parts of the energy sector. I mentioned last week that I am seeing bullish signals in the market. One reason for the recovery in the overall market was the recent recovery in the price of crude oil, which sold off from October to December. But with global growth showing signs of a slowdown, crude has pulled back a bit, and I think it’s likely to stay in a trading range in the $50 per barrel area. PSX, like all refiners, has to buy crude oil to refine. Unlike exploration and production companies, PSX actually wants oil to trade at a lower price. Oil prices continue to struggle as supply increases and demand fails to match. The number of U.S. oil rigs is still increasing, which means production is increasing. Further supply cuts from the Organization of the Petroleum Exporting Countries (OPEC) may help balance out supply and demand, but I think prices will stay low. Lower crude oil prices mean lower costs for PSX, and that should keep share prices up. PSX has been channeling sideways since mid-January. The stock has established support at the $91 level, though it also has some resistance at about $96. While resistance at the $96 level might seem like bad news, the trade I’m recommending doesn’t require PSX to break out. With a naked put write, we only need the option to stay above our strike price prior to expiration. Since PSX has been consolidating sideways and oil prices are trading in the $50-range, we can sell out-of-the-money puts without worrying too much about a move to the downside. Sell to open the PSX March 15th $80 put at about $0.35. Note: There are several March expirations available for PSX options. Be sure you are opening the monthly options that expire on Friday, March 15, 2019. There is still a risk that PSX will trade below our $80 strike price prior to expiration. If that happens, we would be put the shares. This is a high risk trade, so take a small position. Article printed from InvestorPlace Media, https://investorplace.com/2019/02/psx-could-benefit-from-lower-crude-oil-prices/.